critical than ever for colleges and universities to promote programs that will provide students with a pathway toward a bright future in the industry. Western Washington University (WWU; Bellingham, WA) is known for its Plastics and Composites Engineering (PCE) program, and Professor Nicole Hoekstra is always looking for opportunities to tell the industry about it. The school attracts students into the PCE program in several different ways, explains Hoekstra. 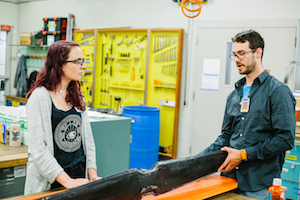 WWU’s Engineering and Design department hosts an annual open house and student showcase every spring, where seniors present their research to industry partners and the campus community. The school also has a family open house in the fall, when labs are open and students and faculty give program tours. The PCE program is primarily a manufacturing engineering curriculum focusing on plastic and composite manufacturing processes. The program also has extensive classes in polymer chemistry and characterization, and advances plastics manufacturing in several ways. The only accredited plastics engineering program west of Kansas, the school’s well-equipped labs ensure graduates are proficient with production-scale processing equipment, quality assurance strategies and characterization techniques. Another way the program advances plastics manufacturing is through applied research collaboration with industry partners. These research projects include product design, material design, process optimization, forensics, testing and analysis. WWU’s PCE program differs from other university programs in several ways, Hoekstra explained. “WWU’s PCE is a unique combination of manufacturing engineering and polymer chemistry. Students learn how processing, material structure and properties influence each other,” she said. “There are only four accredited programs in the U.S.
that offer instruction in thermoplastic processing, and WWU is the only one in the western United States. We’re also a very hands-on, team-based, laboratory-intensive learning environment. All junior and senior year courses have multiple smaller laboratory projects or a single 10-week long project. There are some who believe that the bad rap plastics gets from the mainstream media who know little to nothing about the actual science of plastics often cause students to shy away from entering a plastics program as a career path. With the interest in composites (particularly reinforced plastic composite materials) increasing because of lightweighting efforts in the transportation industry—automotive, trucking, and aircraft, all of which have a fairly large presence in the Pacific Northwest—Hoekstra says the experience with her program has been in the opposite direction. R&D Plastics (Hillsboro, OR) works closely with WWU’s PCE program and provides internships and other work opportunities for students. Rod Roth, President of R&D, is a primary promoter of WWU’s program. His father, Merrill Roth, was a leader in the injection molding industry in the Pacific Northwest. Scholarships are available to students through the Merrill Roth PET Memorial Scholarship that is given to students with an interest in injection molding and a demonstrated financial need. Another scholarship endowment was provided as a memorial to Rod Roth’s mother, Ivy Roth, through the Ivy Roth Memorial Plastics Scholarship: Two scholarships are provided annually for students with majors in the PCE program or a related field of study.